Located on the most northern point of Lake Superior, Nipigon is pretty much the only true town between Geraldton and Thunder Bay. You know what this means. Out of the way Tim-Br Mart. Nipigon has a Canadian Tire…! When you drive into many northern towns, there’s usually a sign telling you that they’re the home of a semi-famous Canadian celebrity. Figure skater Kris Wirtz has a sign outside of Marathon. Boxer Domenic Filane has a sign outside of Schreiber. Shania Twain has about twelve signs leading three directions into Timmins. Well, fooling around on the internet one day I found out that a crater on Mars was named after Nipigon. Instead, you’re greeted by a sign that tells you that churches are open Sundays and are directed to a ‘scenic lookout’ which looks out over a cemetery. Is this considered a God’s-eye view? Nipigon does have an abundance of churches, and the town’s Catholic Church even has a little shrine beside its virgin Mary statue. 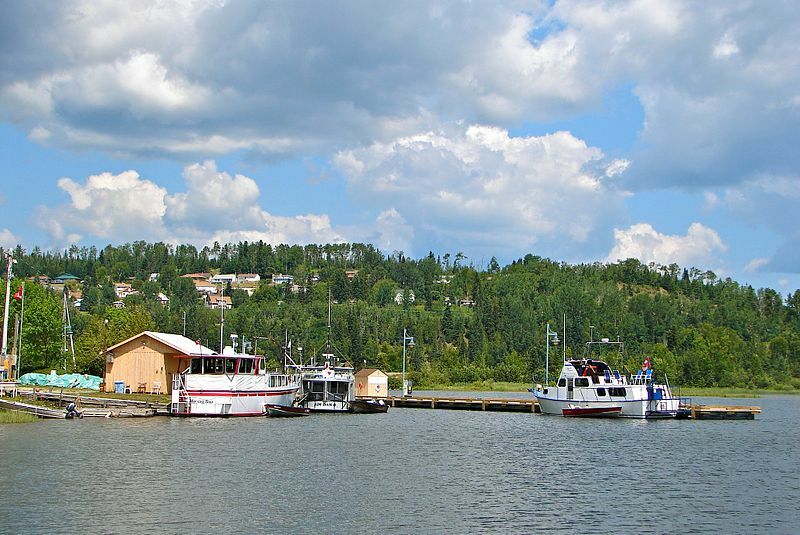 Hydroelectricity, fishing, forestry, tourism are the mainstays of Nipigon’s 2000 people. (I wonder if they did the census in the summer, and how that would impact the head-count – there seem to be some cottages in the area.) Nipigon is blessed with a scenic little harbour, complete with a waterfront park, a boat launch, and hiking trails. It even has a nice kid’s bookshop, and a stained glass store to boot. This is not your average Highway 11 town. Well, I take that last statement back. Nipigon is your average Highway 11 town because, of course, it has to have its share of weirdness. Of course, there is the mandatory “big weird thing in town”, but also in this case, it is public art. Nipigon seems to love murals. I counted four, plus the town museum which has paintings on it as well. The one on the Legion celebrates forestry. Another recognizes the history of the railroad. A third shows the town’s first general store. A fourth celebrates ‘northern Ontario time’ – encouraging workers to call in sick in order to go fishing. It’s a great idea. I’m a sucker for any kind of public art. Like most northern Ontario towns, Nipigon has a festival and a some big weird thing displayed in town. Every August long weekend the town celebrates the Blueberry Blast festival, although I was there on the long weekend and didn’t see any blueberries raining down anywhere in the town. In the “some big weird thing” category, Nipigon has two entries, 1) a historic turbine taken from the electrical plant up the river, and 2) a big trout on the highway. Nipigon is the best stop to eat or refuel before you hit Thunder Bay or Geraldton. There is a foodmart, a Robin’s Doughnuts, multiple gas bars, a Beer Store, a Mac’s Milk, a few motels, a bank or two, a Subway where I waited 70 minutes to get a sub (beware of people coming in from camps and ordering 12 subs each), and a Pizza Pizza/KFC outlet. Out on the highway there’s Gus’ Broasted Chicken, for those wanting a non-fast food meal. Lots of people end up leaving Highway 11 for Highway 17 after Nipigon. If you’re interested, check out the towns that run along Lake Superior’s shore by going off-route here. Oddly, east of Nipigon past Highway 11 there is an ad for construction company in based in Hearst. That’s past Highway 11. In the opposite direction of Hearst. Really, it’s nowhere at all near the town. Do the owners know where they’re being advertised? Nipigon is also the town that got me in trouble in Grade Four. Whilst playing Cross-Country Canada in computer class, Mme. Bennedsen caught me and three other kids giggling at the computer screen. Now, this long before the advent of the internet, so in hindsight there wasn’t much risk we were up to anything particularly nefarious. But maybe she was having a bad day, or maybe she was practicing her walk-stare-scold combo for use in future computer classes once the internet became a fixture of public education – whatever the reason, she rushed up toward us, eyes glaring, finger pointing, heels clicking ominously. We looked at each other. Once of us would have to come clean. After multiple protestations from us that we were up to nothing, she finally flushed it from us. And I took the hit for the four of us. I was forced to stand before the class, head bowed, and admit out loud that there was, in fact, no town in Ontario named Nipplegone. This entry was posted in The Northwest and tagged amenities, big weird things, festivals, hiking, murals, waterfront by Highway11.ca Editor. Bookmark the permalink. Ah… Nipigon. My home for the glorious summers of 1981 and 1982. One of my fellow treeplanters from those days is now the Mayor. Breakfast in the Nipigon Cafe ! We bring to your attention that our little Nipigon holds the trade-mark for world-famous Nipigon Nylons (TM). Products can be purchased at various outlets in our little town. Vist Nipigon! we have superb hiking trails as well and a NEW Paddle to the Sea Park based on the story by Holling c. Holling.